AMSOIL Synthetic 2-Stroke Injector Oil is recommended for use in all two-stroke outboard motor and snowmobiles and where API TC and NMMA TC-W3 oils are specified. 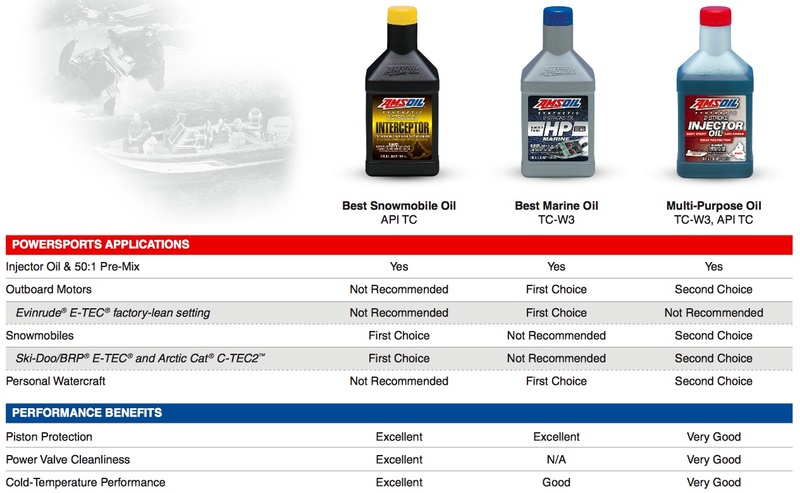 Note: For Evinrude factory-lean setting, use AMSOIL HP Marine Synthetic 2-Stroke Oil. Strenuous conditions define the normal operating environments of snowmobiles and boats. Without the right lubrication, two-stroke snowmobile engines and outboard motors run hotter, accumulate deposits and suffer a reduction in performance. AMSOIL Synthetic 2-Stroke Injector Oil offers the convenience of one formula for the tough conditions of all two-stroke recreational equipment requiring NMMA TC-W3 and API TC two-stroke oil. It's tested and proven to minimize wear and deposits that can damage internal components. AMSOIL Synthetic 2-Stroke Injector Oil provides quality and affordability for cost-conscious enthusiasts who want the benefits of synthetic two-stroke oil. 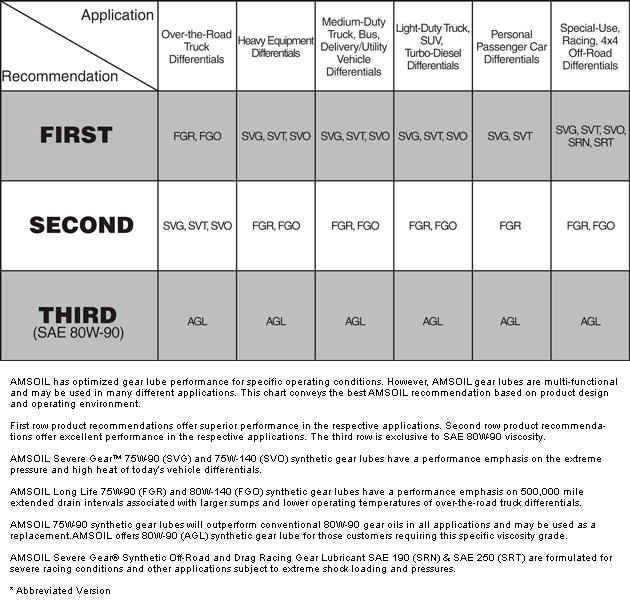 Click here to view the MSDS Data Sheet for AMSOIL AIO. Votes & Reviews: 25 vote(s) and 18 user reviews. I use this oil in my snowmobile. It's nice n thin even in the negative cold temps. 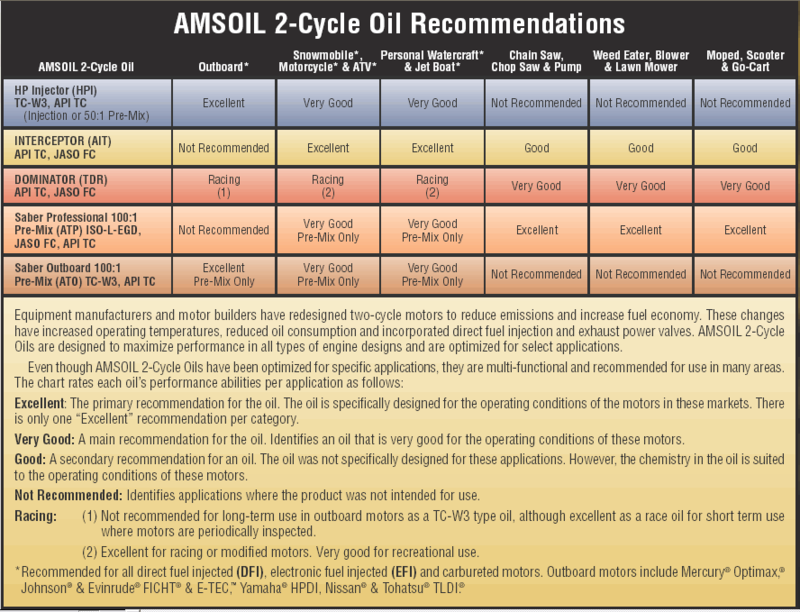 I have ran most of Amsoil's 2 Stroke Outboard Oils for 20yrs with zero Oil related problems. I am currently running the 2 Stroke Injector Oil in a 250 Yamaha. It is a Tremendous Oil providing quite, and smooth operation. Fantastic Oil have been using it for 20 years now. I have been using Injector Oil in all my hi performance outboards since 2000. Most notably on my Evinrude outboard hi performance ETec engines. I noticed that whenever I changed oil to another brand, it would not take long to build up a sludgy deposit in the exhaust at the propeller. Using Injector oil cleaned this deposit out fairly quickly and I never noticed any smoke coming from any of the engines when using it. I use this oil in my Mercury 200 Opti Max salt and in my Evenrude E-Tec 250. Works well, never smokes, and fuel economy seems better. I've used it in my Mercury since it came on the market. No reason to buy petroleum based oil again! I use this in my 20 year old Evinrude 175 2-stroke outboard and enjoy less smoke from the motor while water skiing or at idle than I have ever seen with even the best petroleum based 2-stroke oils, and with the membership, it's virtually the same cost! Awesome product always use amsoil for it all. Old skidoo's and motorcycles love this oil. Perfect for my Yamaha Waverunner! I have an older XLT 1200, converted to premix. This oil, mixed at 45:1, has significantly reduced low speed smoking and has cleaned up the power valves. I could probably run it at 50:1 as suggested but my ski is a bit modified. Excellent Value! Used in a 200 hp outboard, no complaints thus far. Works great in my old sea doos and priced fairly!